For our esteemed customers, we have brought forward Cube Mould, manufactured in accordance with the industry approved norms. We are using the finest quality cast iron and mild steel to manufacture this mould and offer in various sizes to our clients. 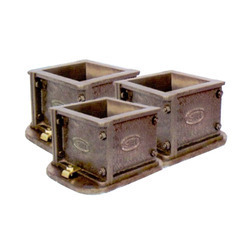 The offered mould is extensively demanded across the nation for being superior in terms of quality. These are offered to our valued clients at leading industry rates. Looking for Cube Mould ?